Tip: Also check out the Pixel Spirit Deck Table post for another example of minimalist design with shaders. As it already has a deep history, we can start by asking, what are some of the signature styles of minimalism in live visuals? We begin this lesson by loading the 4 Layer VJ Starter template then loading in some of the built-in video generator sources for basic shapes, lines noise and other types of geometric patterns that will be the basis for our minimalist designs. Parameters such as the random seed, offsets, rotations and other FX controls are then automated using Step Sequencers and LFO plugins. The Color Controls FX can be used on the main output to remove colors by desaturating the video as a means to always provide a black and white output, or the Color Desaturation Mask can be used to limit the output to a single color. 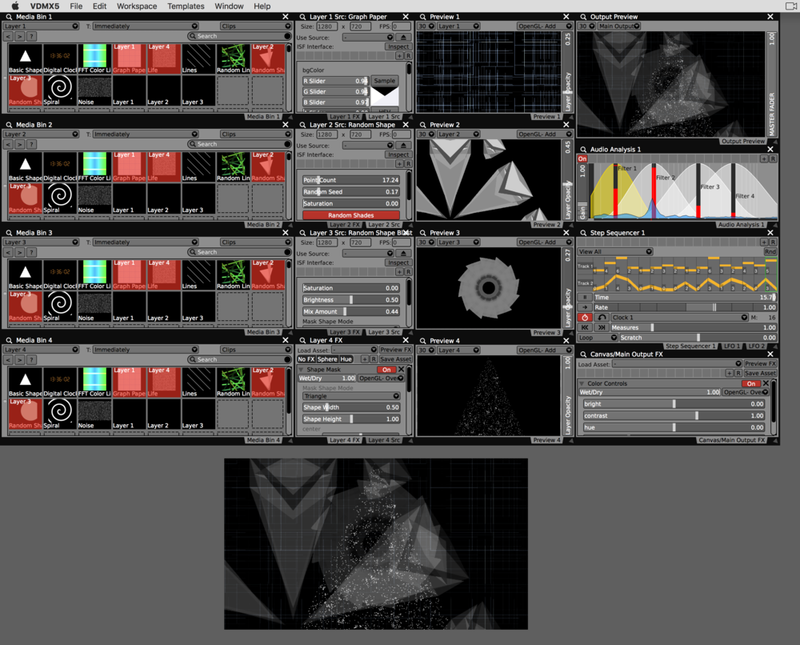 The Shape Mask is applied to layers to add an extra level of geometry and composition control within the output. To test the setup against actual music we load the YouTube royalty free library and use SoundFlower to pass the audio stream into the Clock plugin for BPM detection and to create audio visualization as a layer generator. Step Sequencer color tracks can be used to animate color properties. Control Surface plugins can be used to create custom sets of sliders, buttons, color pickers and other UI elements. Check out the tutorial on using Layer Masks for more tips on using masks for composition. Visit www.interactiveshaderformat.com to find more visual generators and FX to use in VDMX. Gestalt principles are commonly found in minimalist visuals.